Austin rock band Spoon has been mak­ing music since it was found­ed in 1993, releas­ing increas­ing­ly pop­u­lar albums, from their 1996 LP Tele­phono to their newest album, Trans­fer­ence, released on the 19th. Spoon has long built their music on a sol­id rock base with the instru­men­tal flour­ish­es that make Spoon Spoon, and that’s what Trans­fer­ence dis­plays - though with­out some of the unfet­tered ener­gy of Spoon’s best work. The instru­men­tals on Trans­fer­ence span the entire spec­trum from repet­i­tive and sim­ple to high­ly lay­ered (and only slight­ly repet­i­tive). But while diver­si­ty in this sense is cer­tain­ly desir­able, the instru­men­tals also vary high­ly with respect to qual­i­ty, and not in cor­re­la­tion to com­plex­i­ty. The won­der­ful, dis­so­nant lay­er­ing of the first track works excel­lent­ly with Brett Daniel’s almost grat­ing tones, but “Trou­ble Comes Run­ning,” slight­ly less well orga­nized than oth­er tracks, becomes rather caco­phanous and some­what over­bear­ing. Alter­na­tive­ly, “I Saw the Light” has rel­a­tive­ly few lay­ers, instead using ter­rif­ic pro­gres­sions in layering’s place, while a num­ber of the final tracks on the album get lost among the rest of the tracks due to their over­whelm­ing sim­plic­i­ty. Trans­fer­ence also varies great­ly in its treat­ment of indi­vid­ual parts. The rough sound of the album open­er is fol­lowed with an almost indus­tri­al drum­beat, then off­set by a con­trast­ing gui­tar part. On the third track, how­ev­er, the fair­ly catchy bass line takes the role of push­ing the track along while the drums assume a very basic beat which is main­tained quite steadi­ly. Back­up vocals also serve as a huge part of the album, from their frankly weird entrances on “Is Love For­ev­er?” to their more con­ven­tion­al parts on “Writ­ten in Reverse,” which itself main­tains what is almost a jazz/funk sound. Brett Daniel’s voice has been strik­ing­ly notable in all of Spoon’s work thus far, and Trans­fer­ence is no excep­tion. Daniels switch­es between a con­stant, com­fort­able tone (see “Good­night Lau­ra”) and his trade­mark falset­to, alter­nate­ly cre­at­ing the calm of that track and the curi­ous ener­gy of “Writ­ten in Reverse” (for exam­ple). Though Daniels isn’t quite as emi­nent­ly ener­getic as on some of Spoon’s best albums, there are some good moments on Trans­fer­ence - the raw ener­gy of “Trou­ble Comes Run­ning” brings Tele­phono’s joy­ous ruckus to mind. Lyri­cal­ly, Trans­fer­ence expert­ly skirts the line between non­sense and enter­tain­ment. Daniel sings “Pic­ture your­self / Set up for good in a whole oth­er life / In the mys­tery zone” on “Mys­tery Zone,” declares “Slaves …on the hors­es / Princes walk the ground like they’re slaves” on “Trou­ble Comes Run­ning,” and sings a lul­labye on “Good­bye Lau­ra.” In this way, Trans­fer­ence man­ages to stay most­ly inter­est­ing. It is true that Trans­fer­ence relies upon a good bit of rep­e­ti­tion - but Daniel and the rest of Spoon gen­er­al­ly know how to keep it enter­tain­ing. 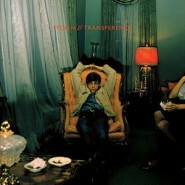 Trans­fer­ence is a very mixed album. It is repet­i­tive, and it is solid­ly con­struct­ed. It moves eas­i­ly between dense and open, and it is diverse in many sens­es of the word. Trans­fer­ence has a num­ber of quite sol­id tracks, as well as a dose of weak­er ones. It is, how­ev­er, impor­tant to note that there are no tru­ly amaz­ing tracks. The album at its best is great, not incred­i­ble, and fac­tor­ing in the weak­er parts, Trans­fer­ence as a whole is sim­ply good.